It is with great joy that I show you this article from The Business Times, where I was featured. Zentangle is not the name of the latest dance craze, nor is it a hairbrush that promises to keep tangles away while making you feel zen. Instead, it's a way of creating uncomplicated, abstract drawings using simple repeat patterns. According to Stephanie Jennifer, a certified Zentangle teacher: "As your mind focuses on drawing these patterns, your body relaxes, achieving a state similar to what people feel when they meditate. Time passes without your notice, your thoughts clear, and anxiety fades away." 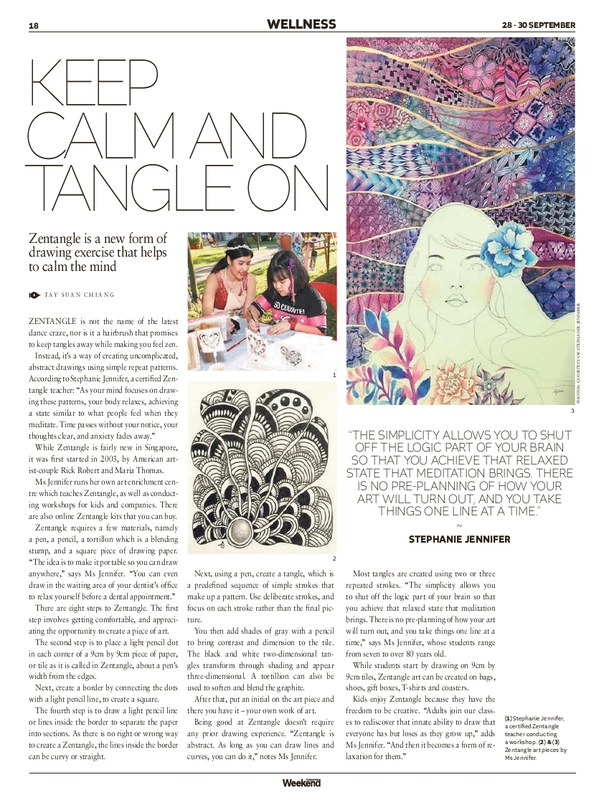 While Zentangle is fairly new in Singapore, it was first started in 2003, by American artist-couple Rick Robert and Maria Thomas. Ms Jennifer runs her own art enrichment centre which teaches Zentangle, as well as conducting workshops for kids and companies. There are also online Zentangle kits that you can buy. Zentangle requires a few materials, namely a pen, a pencil, a tortillon which is a blending stump, and a square piece of drawing paper. "The idea is to make it portable so you can draw anywhere," says Ms Jennifer. "You can even draw in the waiting area of your dentist's office to relax yourself before a dental appointment." There are eight steps to Zentangle. The first step involves getting comfortable, and appreciating the opportunity to create a piece of art. The second step is to place a light pencil dot in each corner of a 9cm by 9cm piece of paper, or tile as it is called in Zentangle, about a pen's width from the edges. Next, create a border by connecting the dots with a light pencil line, to create a square. The fourth step is to draw a light pencil line or lines inside the border to separate the paper into sections. As there is no right or wrong way to create a Zentangle, the lines inside the border can be curvy or straight. Next, using a pen, create a tangle, which is a predefined sequence of simple strokes that make up a pattern. Use deliberate strokes, and focus on each stroke rather than the final picture. You then add shades of gray with a pencil to bring contrast and dimension to the tile. The black and white two-dimensional tangles transform through shading and appear three-dimensional. A tortillion can also be used to soften and blend the graphite. After that, put an initial on the art piece and there you have it - your own work of art. Being good at Zentangle doesn't require any prior drawing experience. "Zentangle is abstract. As long as you can draw lines and curves, you can do it," notes Ms Jennifer. Most tangles are created using two or three repeated strokes. "The simplicity allows you to shut off the logic part of your brain so that you achieve that relaxed state that meditation brings. There is no pre-planning of how your art will turn out, and you take things one line at a time," says Ms Jennifer, whose students range from seven to over 80 years old. While students start by drawing on 9cm by 9cm tiles, Zentangle art can be created on bags, shoes, gift boxes, T-shirts and coasters. Kids enjoy Zentangle because they have the freedom to be creative. "Adults join our classes to rediscover that innate ability to draw that everyone has but loses as they grow up," adds Ms Jennifer. "And then it becomes a form of relaxation for them."